I am amidst a love affair with w7 products at the moment and with most products under £8 that is very good news for my purse. This year I talked about these goodies from the range - the Angel Eyes palette being one of my most heavily travelled and used shadow collections of all time. 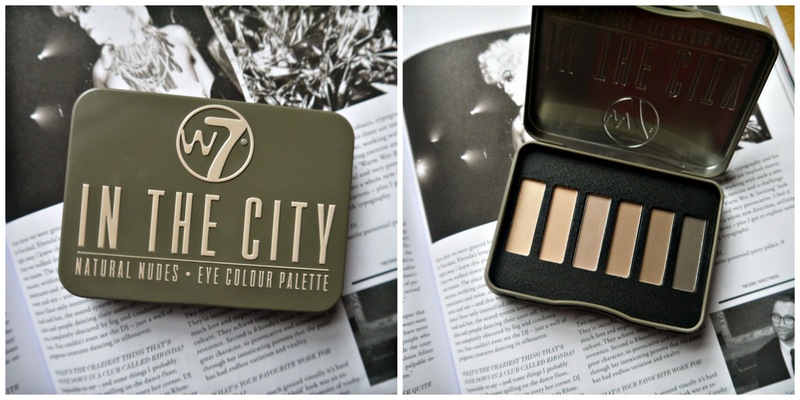 I do think that I have indeed found its competitor in the form of the 'In the city' palette. Six, matte, buttery, highly pigmented shadows for £4.50 and presented in a gorgeous little tin - I don't know what it is but i've always had a 'thing' for tins. I love the blocky text and branding of this product and the shadows as I anticipated are ah-mazing. I use the darkest brown shade on my brows and mix and match different eye shadow combos with the other 5 shades. This palette is perfect for popping in your handbag for at work touch-ups of for travelling when you don't have the capacity to carry larger palettes (think UDNP) or many invidiual shadows.